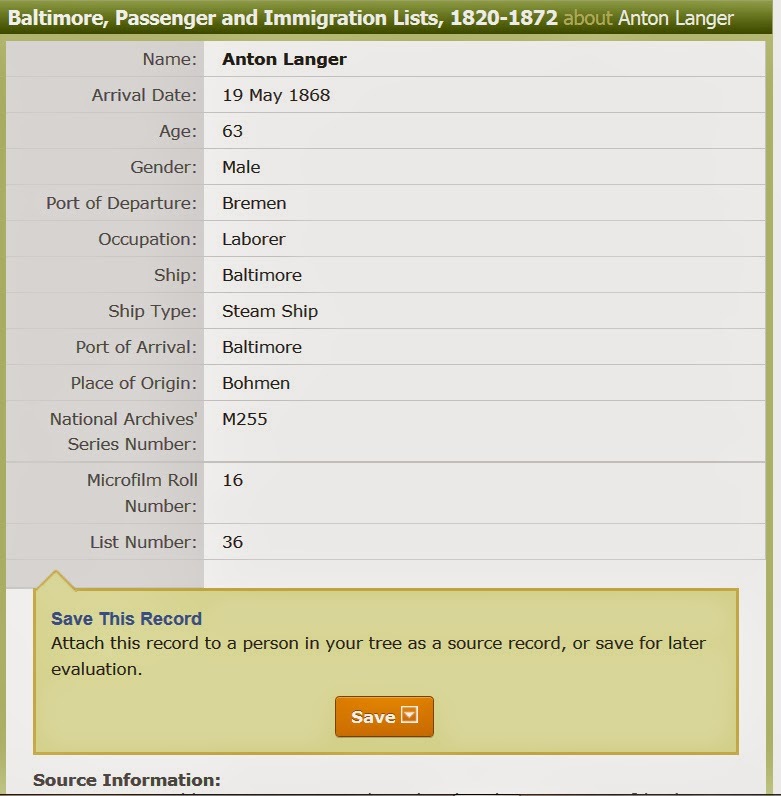 So, we have Anton Langer, born 19 May 1804, and his wife, Johanna Kura, birth date unknown. I didn't find any record of either Johanna or Barbara in my search through the Kirchenbuecher, so let's assume, just for the sake of argument, that the "Barbara" is a mistake, and Johanna was the mother of all the children, Carl, Anna, Johann, and Maximilian. This is from the 1880 United States Census; this family lived in Emmet, Wisconsin. The father is John, his wife Barbara, their children, and Anton Langer, father. John is age 50, which means he was born around 1830; Anton is 76, therefore born around 1804. 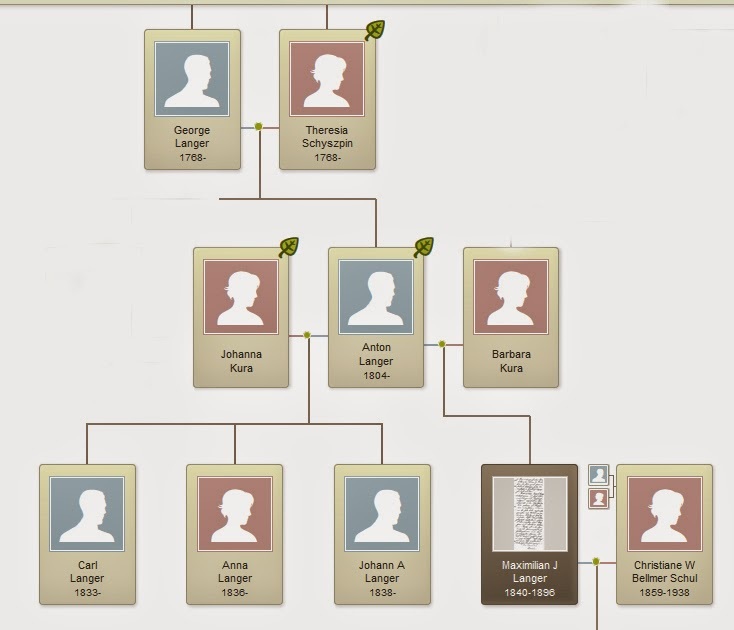 If you look back at the family tree excerpt, Anton was indeed born in 1804 and Johann in 1838. That's off, but let's keep going. Notice also that it says they're from Prussia. We have the same family: Johann (not John), age 39, his wife Barbara and children, and father Anton, age 66. Anton would have been born in 1804, and Johann in 1831. Notice that in this earlier census, they say they came from Bohemia, not Prussia. "My" Langers came from Silesia, an area that changed hands many times over the centuries. I've looked at a number of maps, and while Bohemia and Silesia are geographically close to one another, I can't find a time when they overlapped. Would someone from Silesia have a reason to say that they were from Bohemia? I don't know. This looks like the person in the censuses above, who would have landed in Baltimore and then made his way to Wisconsin to visit his son. The things that might be "off" about this document? Again, it says "Bohmen," Bohemia, instead of Silesia; it also lists him as a "laborer," when we know that Anton was a master weaver back in Oberglogau. Would he have had a reason for saying he was a laborer rather than a skilled craftsman? I don't know -- this is all tantalizing, but are these "my" Langers? Why do I think it could be? I know that at some point at least Maximilian left Oberglogau, because he married my great-grandmother in either Bremen or Bremerhaven. Silesia was undergoing very difficult times in the mid-1800s; people were literally starving to death. So would they all, or some of them, have left? I'll have to do a lot more research to find out whether this move to America could have happened with my ancestors. Still, it's interesting to take one of these side trails every now and then, to chase a "teaser" down, to wonder, "what if?" "could it be so?" Oh, and that little rant about Ancestry? They have sliders now, right? To make searches more or less specific. I don't understand, though, when I put the slider on "Exact" for Germany, or when I use the drop-down menu to choose "German Collections," it still gives me stuff from all over the place. It's kind of frustrating. Do you follow "teasers"? Have you had success with that? Let me know. I hope you figure out if these are all the same family or not! As far as Ancestry's 'sliders', I was using one today and told it I wanted an "exact" location... and it, too, gave me answers from everywhere! I don't understand why these aren't doing what we expect them to do! They really don't seem to work right -- thanks for stopping by! Elise, just wanted to say how much I'm enjoying your blog. I've been reading for a week or two now and love your topics and your writing style. You do a great job capturing your family history in your writing. Thank you so much, Joe! I appreciate your feedback. I'm having a lot of fun putting this together.